It’s easy to recycle your food scraps from your home and business with compost bins and wormfarms. You can halve your rubbish and create your own high quality organic fertiliser for growing healthy veggies and plants. Composting and wormfarming also prevents wasteful transport of food scraps to landfill where they produce harmful greenhouse gases. What’s best for my home? Composts are often best for houses. They are bigger and can hold more food waste as well as garden waste. As they are more compact, wormfarms are great for apartments and small houses, and can go inside or on balconies in a shaded spot. Want a discounted compost bin or wormfarm? Do Council’s free online tutorial and quiz at Compost Revolution, then receive your discounted compost or wormfarm (plus worms) delivered to your door. All residents of Waverley are eligible for an 80% discounted worm farm or compost bin. Join the 3700 Waverley households already participating in the Compost Revolution! Want to learn how to compost or wormfarm? 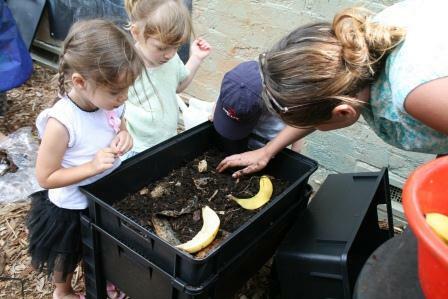 Explore Council’s free online, step-by-step guide to composting and wormfarming. Book in to one of Council’s FREE face-to-face workshops with local composting champions. For community compost bins: Make a list of people interested in using it, take a photo of where you’d like the bins to go, then email them to your Compost REvolution Program Manager. The Compost Revolution program can provide bins, training and support for you and your group or business. For businesses: Email us or call 9083 8112, and we may be able to offer consultancy and resources, depending on your situation. For schools: Up to four discounted compost bins or wormfarms are available per school once you complete the online tutorial and quiz. For larger scale community composting projects, please email us or call 9083 8112. Check out sharewaste.com if you want to use share a compost bin with your neighbours. Got a specific question about composting or wormfarming? Post your question on the Reduce Your Footprint online forum and one of our local compost ambassadors will get back to you with the information you need. Need spare compost or wormfarming parts? Contact Tumbleweed on 1800 809 088. Get the latest news and tips on creating an environmentally sustainable community, free eco-wise workshops and events, delivered straight to your inbox each month.